Total Score: 7.83 - ULTIMATE ENTHUSIAST AWARD! 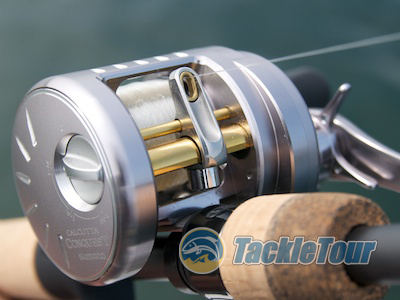 Introduction: Here at TackleTour, we do our best to cover the latest and greatest in fishing tackle. If it is pertinent, we are likely fishing it enroute to a full blown review. Certainly there are items that slip under the dock or fall to the bottom of our tackle box simply due to sheer volume of product that we see each and every year. Case in point? Quite often we’ll have a product ready to write up, but we need one little bit of information and when we don’t get it in a timely fashion, we lose momentum and the product is lost out of sight and out of mind until something at a later point in time reminds us to bring that item back up to the front of the line. 2011 marks the year, that Shimano ports DC technology the Conquest platform in the 50 sized lineup. Well, if there is one product line that almost assuredly is guaranteed immediate attention, at least by me, it’s the fifty sized, round reel offerings from Shimano Japan. 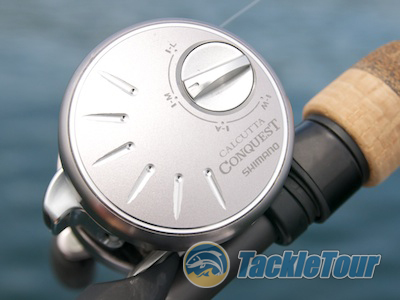 The Conquest 51 is simply one of my all time favorite reels. Is it the best caster for distance? Far from it. Does it have the best drag? It’s pretty weak in stock configuration really. 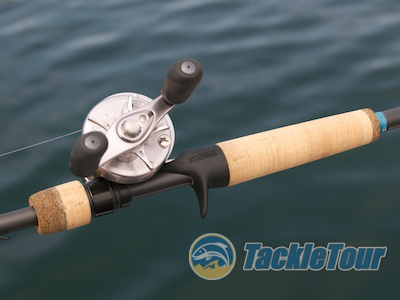 It’s certainly not the lightest reel out there nor is it easily acquired any longer. In fact, I think I may have heard rumors of it having been discontinued all together, but I doubt it. No, the Conquest 50/51 is not perfect, but when it comes to putting a smile on my face and really, re-energizing my enthusiast spirit, no other reel affects me the way that Conquest 51 does. It is a precise bit of machinery that is the very definition of what inspires the enthusiast spirit. 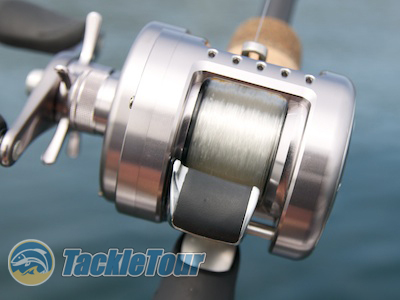 Last year, Shimano Japan introduced an updated DC technology to their Conquest line of reels. With that update came a new look for Conquest DC. There are a couple of variations of this reel. The Conquest 50/51 Shallow Special and the Cardiff 50/51DC, a reel that looks every bit a “Conquest” but is targeted for the trout angling market and a reel that just did not quite cut it with yours truly. It’s a good reel, and was scored accordingly, but really, I wanted more. Gone is the gold highlights and in is a new, silver monotone motif. At the beginning of 2011, at Japan’s equivalent to ICAST, it was announced. Shimano Japan had finally done it. 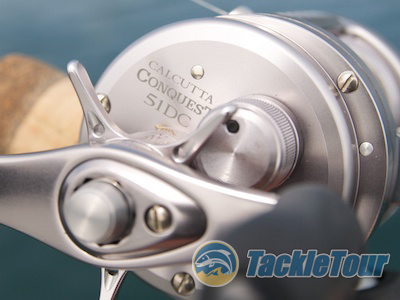 2011 would mark the year, that the DC technology would be ported to the Conquest platform in the 50 sized lineup to produce a true Conquest 50/51DC reel. If it weren�t for the lousy exchange rate, I would have ordered a case. But of course, everything in moderation. How about ordering one first, to see how it performs and move on from there? 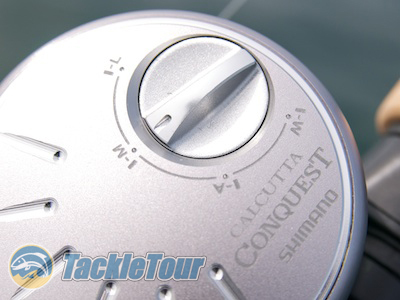 Ok, here now is our take on that very first Conquest 51DC to land at TackleTour HQ. Impressions: Last year, Shimano Japan introduced an updated DC technology to their Conquest line of reels. With that update came a new look for Conquest DC. Gone were the gold highlights and in was a new, silver monotone motif. 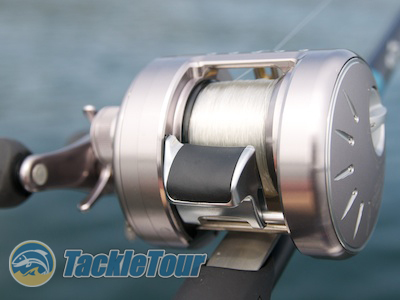 The overall tone of the reel is almost more pewter than silver and certainly gives it a more understated aura. But while the other Conquest DC Reels share a new DC+ brake system, the 50 series is left to make due with the i-DC4. The new DC system is referred to as Digital Control Plus (DC+) and features a dial that lets you tell the reel what type of line you are using whether that be fluorocarbon, nylon mono, or braid. From there, the braking system will make the necessary adjustments to best compliment your casting situation with the specified line. Sounds intriguing doesn't it? I was looking forward to testing this system out but there's only one problem, the Conquest 50/51 DC is using i-DC4, the same system that is in the Metanium MG DC and Cardiff 50/51 DC, not the DC+. Our experience thus far with i-DC4? Quite underwhelming. Our experience thus far with i-DC4? Quite underwhelming. We already know this system is not the best with fluorocarbon lines and while we've used it to acceptable results with braid, we haven't really tested it with nylon monofilament. It's just not a braking system with which we're terribly impressed. This might explain why its yet to find its way into a USDM counterpart. Of course, this is a Conquest 50/51DC we’re talking about so we are obligated to give the i-DC4 another chance so we mounted it on a G.Loomis NRX 852JWR effectively testing two products at the same time. Field Tests: Of course, this is a Conquest 50/51DC we’re talking about so we are obligated to give the i-DC4 another chance. Killing two birds with one cast, I spooled my Conquest 51DC with 10lb test Sunline Supernatural nylon monofilament (it took 72 yards) and mounted it on my G.Loomis NRX 852JWR. Testing grounds for the 51DC? Clear Lake, Lake Berryessa, Lake Sonoma, and the California Delta. When it comes to casting with this reel, really, it’s all about that i-DC4 cast control system of which we’re not very fond.